Many thanks to Ray Routhier for this great article in the Maine Sunday Telegram’s Source section on greening our home offices. I know I learned some new things for my home-based work space! 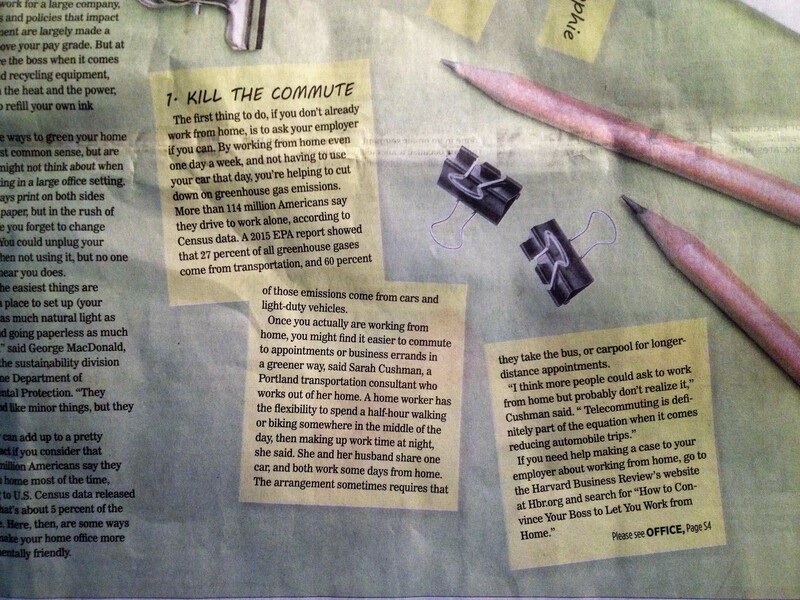 Click on image to read the fine print on killing your commute. Ray called recently to ask me about transportation-related greening for folks working from home – so I appreciate the perspectives he shared from that conversation, too (image below)! Entry filed under: Telecommuting, Transportation Demand Management. Carpool Love	Throwing Down the Gauntlet – businesses challenge each other for Way 2 GO MAINE! Thompson's Point Among Only Two Maine Businesses to Earn a Spot on the Best Workplaces for Commuters' National Recognition List! Throwing Down the Gauntlet - businesses challenge each other for Way 2 GO MAINE! Can fees at parks and on ferries in Maine be used to encourage cyclists and pedestrians?